Some people wait a lifetime for a moment like this. “This” being baby updates from the KarJenner family. The latest update is one of the most exciting yet: Kylie Jenner shared a picture of Baby Stormi’s face! As most of us know at this point, there were rumors for months that Jenner was pregnant. For what felt like forever, we sat and waited for any news about a potential Jenner baby. We knew that Travis Scott and Jenner were dating, we followed every single Kylie Jenner pregnancy conspiracy theory, and we got excited when rumored baby bump pictures emerged. And finally, on February 1st, Jenner confirmed it as casually as anything: Yes, she was pregnant, and yes, she had a baby. Jenner took a break from social media while she was pregnant. But now that Baby Stormi is here, she’s back, and happily sharing her journey as a new mom. And now, the moment we’ve been waiting for is here. Kylie shared a picture of Stormi’s face! Though Jenner first announced Stormi’s arrival with a very sweet picture (and video! ), this is the first official picture that gives us a good look at Stormi’s face. She is so stinking cute! Jenner shared an adorable short video on Snapchat. Even if it’s not her favorite social media platform anymore, she isn’t above utilizing those rad filters. Stormi’s face made its debut on Jenner’s Snapchat on Saturday, March 3rd. 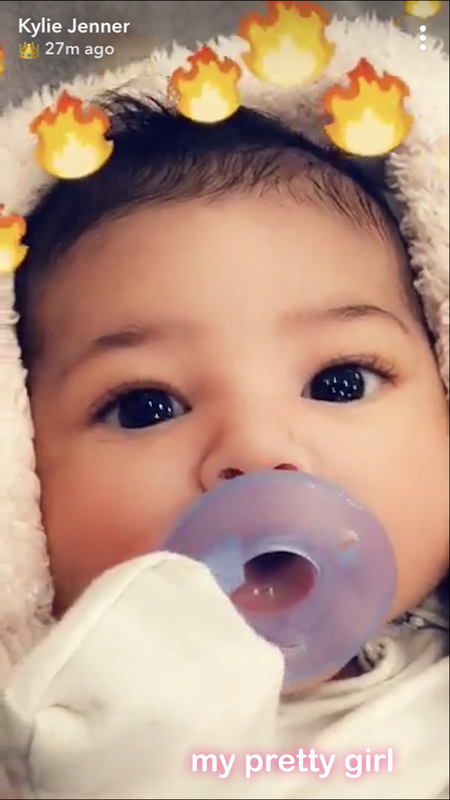 Stormi celebrated her one-month birthday on March 1st. We can’t wait to see more of Stormi’s face over the next few weeks and months. Can we get a group pic with all of the KarJenner cousins or what? The 2018 Kardashian Christmas Card is going to be seriously cute.